Lupane State University was among companies that participated in the Clean-up Campaign for the 2018 Cricket World Cup Qualifiers held recently at Queens Sports Club. The campaign was organized by Bulawayo City Council and partnered by Zimbabwe Cricket. The campaign was launched by Ward 1 Councillor, Cllr M Ncube who was representing the Mayor of the City of Bulawayo, Cllr Martin Moyo who joined proceedings later. Cllr Ncube expressed gratitude to those volunteering for having committed to the cause and making sure that Bulawayo played host to the qualifiers in a clean environment. The university managed to donate 100 bin liners, 50 face masks and 100 latex gloves for use during the clean-up exercise. In his address to Group 2 volunteers which LSU had been placed, His Worship, Mayor Martin Moyo appreciated the University's presence in Bulawayo and efforts towards the clean-up campaign ahead of the qualifying games starting 4 March 2018 at Queens Sports Club. 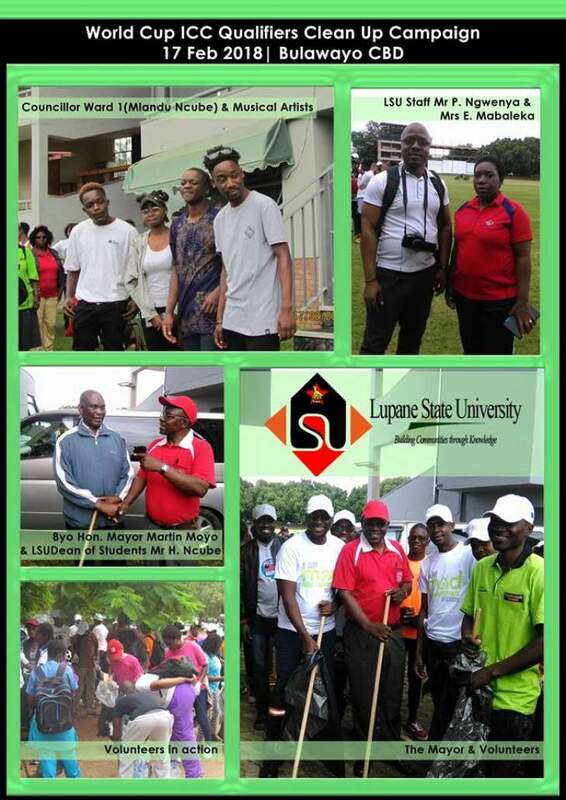 The Dean of Students, Mr. H Ncube, Mrs. E Mabaleka and Mr. P Ngwenya were among the LSU Staff members that participated in the clean-up exercise.